I’m proud to say that I hail from the (suburbs of) the wonderful city of Philadelphia, Pennsylvania. We lived in a small town called Langhorne until I was in middle school, when my Dad accepted a job down in Maryland and we’ve been there ever since. I still love Philly, and every time I’m back in the area I try to stop and catch a game or grab a cheesesteak. 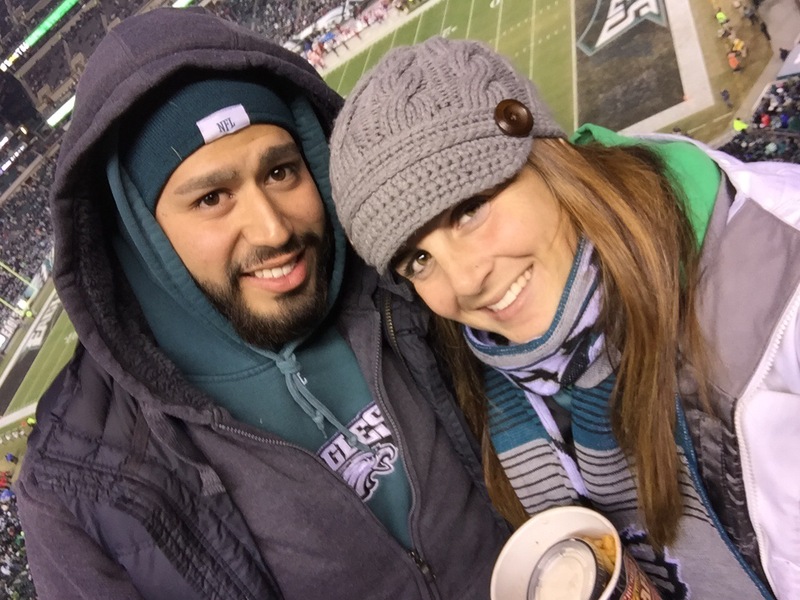 This was Julio’s first time in Philly, and we wanted to make sure we saw an Eagles game while we were in town. Granted, this was decided before the season started and I realized how awful we were this year, but nonetheless, Julio and I, along with my brother and cousin and their girlfriends bought tickets for the Eagles/Cardinals game. The original plan was scheduled around a 1pm game; we were going to drive up early from MD, tailgate, watch the game and then Julio and I were taking the train to NYC that night. However, our game got flexed to 8:30pm which threw a wrench in my carefully laid plans and made me dread going to the game at night in 30 degree weather. Luckily we were able to change our train tickets free of charge and thought, now we can spend the whole day in Philly beforehand exploring and seeing the sights. 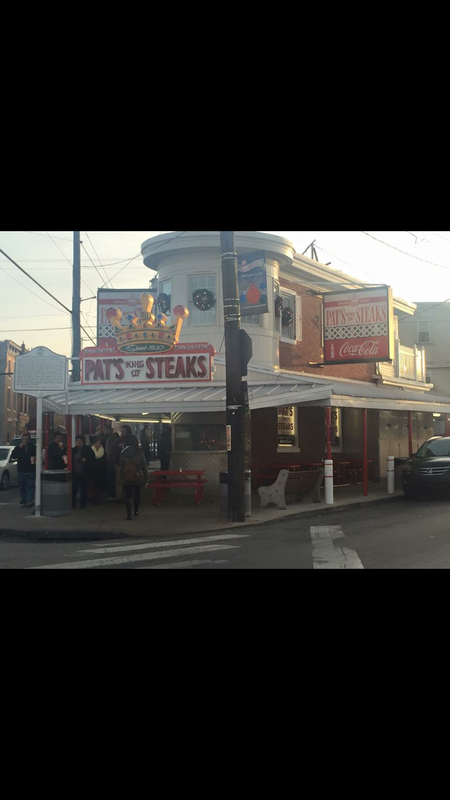 Sadly, we were doing laundry and running late, so we only got to make a quick stop at Pat’s and Geno’s (the two most well known cheesesteak places in town, conveniently located right across the street from one another) before we headed to the game. We decided to get a traditional cheesesteak from each spot to compare and decide which was better. 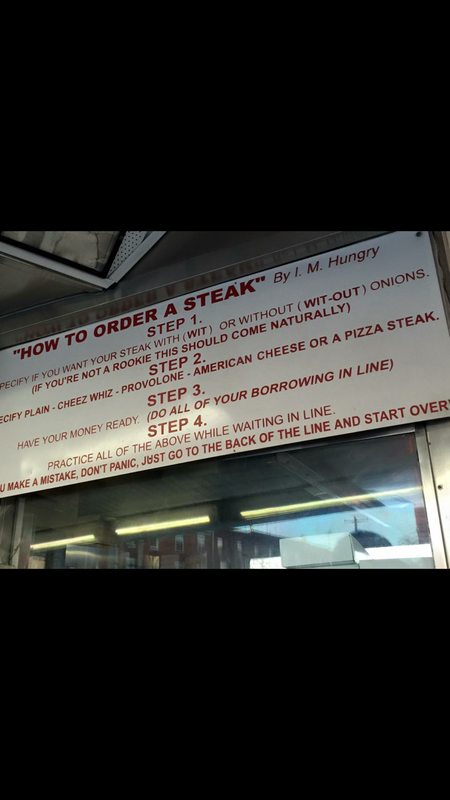 For those of you who have never been to Philly and/or ordered a cheesesteak, there’s a very precise was of doing things. There’s even a sign at Pat’s that reminds you how to order and instructs you to “go to the end of the line and start over” if you mess it up. The traditional cheesesteak actually has cheese whiz on it, not provolone, and grilled onions. Therefore, when ordering, you say “I’ll have one whiz wit please.” If you don’t want onions, you say “wit-out.” Drinks are ordered at the second window and you’re expected to quickly grab your sandwich and move down the line. We ordered our first sandwich at Pat’s, along with a hot chocolate and fries because it was already 40 degrees at 4pm. We split that one and then walked over to Geno’s and ordered a sandwich to go, which we ate later at our tailgate. 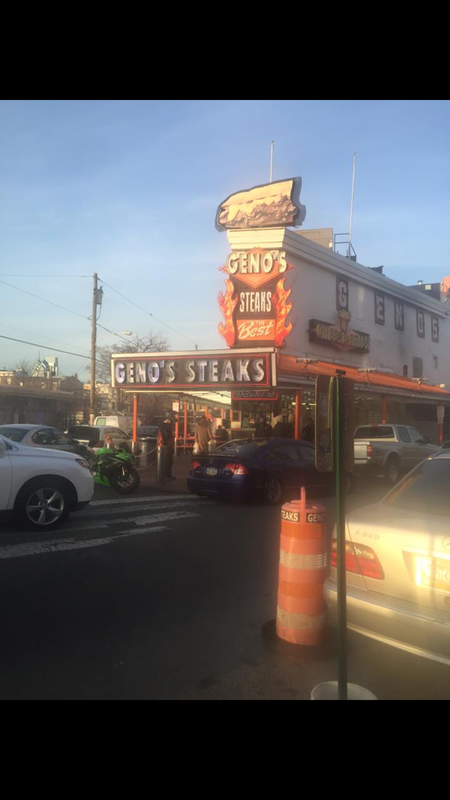 I’ve got to say, and Julio agrees, Pat’s cheesesteaks were a little better than Geno’s! 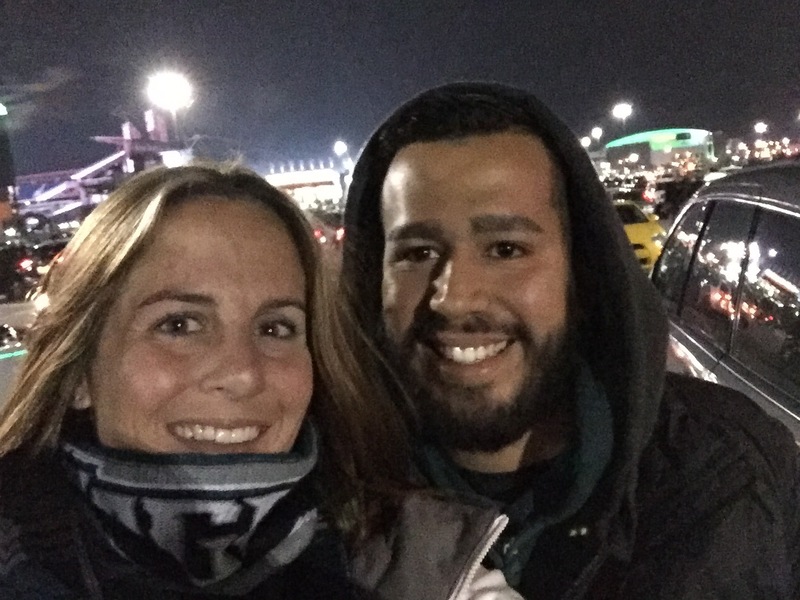 We met up with my brother and his girlfriend Kelsey at their hotel and then headed over to the game. Parking was ridiculously expensive at $40 even though we were in one of the furthest lots from the stadium. We were bundled up in all our winter gear and pregamed for almost 2 hours, with everyone drinking beer and me drinking hot chocolate with peppermint Kahlua. When you’re constantly cold like I am, you’ll do anything to stay warm!! On our way into the stadium, the security woman tried to make me walk all the way back to the car because my wallet was “too big” for me to bring in. I kid you not, it was literally a half inch too long. I almost cried. She said if she made an exception for me she would have to make an exception for everyone, and was just overall rude about the situation until a second security guard stepped in and waved me through. Thank goodness!!! Once we were inside, the mood was electric. Even though we hadn’t been doing well this season, we had won two in a row and we were wearing all black jerseys, which we hadn’t lost in yet. Julio got to see how seriously Philly takes their fans; throughout the entire night we only saw 1 person with an Arizona jersey on. Philadelphia fans are very dedicated and loyal and our fan base turns out 100% for all home games. The first half went pretty well, we had good momentum and were looking great, but we fell apart in the second half. We ended up leaving early because the game was such a blowout but it was a good time to spend with family and friends!